Green Shells, Bob-ombs and slippery Banana Skins. There are a number of obstacles that avid Mario Kart fans have had to dodge over the years, but never have they felt quite so visually immersive as they do within the latest iteration, Mario Kart 7. Stereoscopic 3D visuals aside, this is the classic kart racer that you’ve grown to love – a soiree of your favourite (and maybe not so favourite!) Nintendo characters competing for the top prize whilst introducing a range of new design ideas, items and served alongside an expertly blended mix of brand new and classic courses. 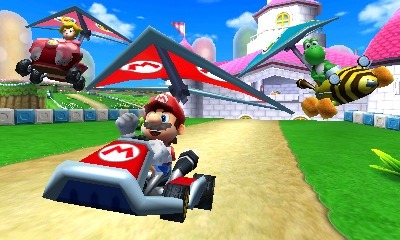 Staying true to form, Mario Kart 7 offers the usual Grand Prix and Time Trial modes, coupled with Balloon Battle and Coin Battle to add a little variance. Grand Prix once again provides 50cc, 100cc and 150cc variants, correlating to easy, average and challenging difficulties, with players participating within eight differing Cups that each comprises of four different courses. Courses themselves encompass sixteen entirely new tracks and a further sixteen retro classics taken from previous entries in the series, which, put simply, sees Nintendo pluck a course from every iteration released across SNES, Nintendo 64, Game Boy Advance, GameCube, Nintendo DS and Wii platforms. Whilst nostalgia is a wondrous thing, it is the new courses that shine most, even if there are a few duds amongst them. Nintendo has turned to the likes of Donkey Kong Country Returns for inspiration, as well as designing a selection of original locations, with their latest variant on the now infamous Rainbow Road a visual spectacle. The Wii Sports Resort courses also introducing a new dynamic, consisting of a single lap divided into continual sections rather than the normal series of three laps. Such courses also act as a showcase for the newly introduced design choices that have been undertaken for Mario Kart 7, namely the underwater and glider sections. Each kart is now kitted out with a built-in propeller that grants you manoeuvrability in the murky depths, and a glider that automatically extends to allow you to soar across chasms. It’s such a natural fit for the series, that it’s a wonder that Nintendo didn’t incorporate it sooner. You’ll be pleased to know that much of Mario Kart’s item arsenal returns, with a few omissions – no Fake Item Boxes, Lightning Clouds Mega Mushrooms or POW Blocks – countered with a trio of replacements. New items include the Fire Flower, which allows you to throw fireballs, the Super Leaf, that sprouts a Tanooki Tail on your vehicle, and Lucky Seven, that equips seven items simultaneously that may be used in turn. Both the Fire Flower and Lucky Seven are well suited, yet the Super Leaf, presumably included to coincide with its reappearance in Super Mario 3D Land, feels next to useless in comparison to the vast array of far more effective ranged items at your disposal. If timed well it can be used to deflect incoming projectiles and hit opponents on the incredibly rare occasion they’re in close proximity to you, but even so, it seems redundant. 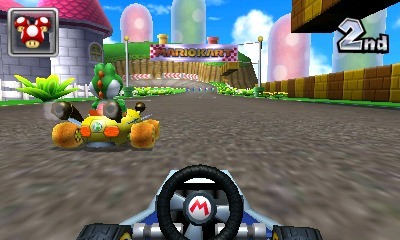 A further addition is the first-person camera view, accessed by pressing up on the D-pad whilst in-game. Whilst serving as a method in which Nintendo was able to incorporate gyroscopic controls, for which peripheral manufacturer Hori have even produced a steering wheel, its inclusion is implemented relatively well – despite the wheel seemingly moving of its own accord, as your characters hands being entirely absent! Players are now also able to explore a range of customisation options for their karts, selecting from a list of unlockable chassis frames, tyres and gliders. These don’t just grant purely aesthetic alterations either, providing the player with a particularly extensive degree of control in affecting the Speed, Acceleration, Weight, Handling and Off-Road capabilities of your kart. It isn’t your choice of character that influences this within Mario Kart 7, now resting entirely on the parts that you opt to use. 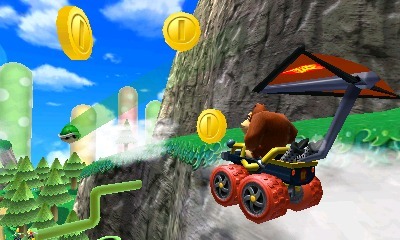 These are unlocked through gathering Coins scattered throughout tracks, of which you can collect a maximum of ten per race. Every time you reach increasing increments of fifty, you’ll be rewarded with an additional part to customise your kart with, and the higher the quantity the more beneficial it’ll be in regards to altering your kart’s statistics. A core facet of Mario Kart 7 that Nintendo have clearly taken great lengths to ensure is up to scratch is the online multiplayer, and it results in being one of the company’s strongest efforts to incorporate such an aspect within their games. You may choose between VS Race or Battle modes, after which you can choose your character and customise your kart before entering matchmaking to speedily find opponents from around the globe. From here, all participating players are able to select a course from those that they’ve personally unlocked that they would like to compete on, from which one is chosen at random. It’s a nice way of ensuring that every racer gets an equal opportunity to have a say in which course is selected. The system isn’t perfect, players having to wait until a race is finished for a brief opportunity to quit before they are thrust into the next with no option to drop out. Similarly, once you’re in such a continual lobby there is no facility to alter the customisable parts of your kart without quitting out to then search for opponents again. Needless to say, it’s a stride in the right direction for Nintendo in terms of online service, even if there are minor flaws. Players are also able to make their own Communities, of which you are allowed to create up to a maximum of eight, that aim to promote group-based online competitive play. You’re able to choose between any of the game’s modes, and specify whether specific/none/all items will be available, a Community Code then being provided which may be shared so that you can enlist more members. However, one oversight is that you aren’t provided with the ability to alter these once created and must either create a separate community or delete it to do so. A Mario Kart Channel also plays home to Ghost Data that you’ve received either through SpotPass or StreetPass, allowing you to challenge yourself in aiming to beat both Nintendo’s best times and those of 3DS owners that you pass. Occasionally you can also receive a list of Community recommendations, inviting players to engage within some of the most active and popular sessions online. 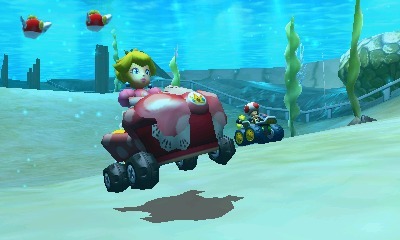 Evolutionary rather than revolutionary, Mario Kart 7 amounts to become the best in the series, if still not perfect. As with Super Mario 3D Land, it’s glaringly obvious that if these games were available at launch the Nintendo 3DS would have perhaps fared far better during its earlier months. Let’s just hope, as Nintendo are surely doing to, that it is enough to significantly aid the handheld both during and beyond the Christmas period.